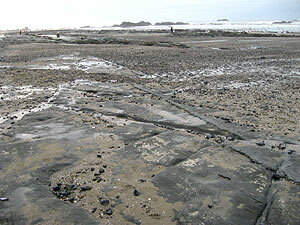 17 million-year-old bedrock shows itself near Seal Rock, along with plenty of agates. 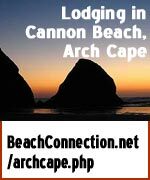 (Oregon Coast) - It's an extraordinary time on Oregon's coast again, as it often is in mid-winter, when wacky stuff appears on the beaches because of storms or low sand levels. This time, however, it's compounded by some unusually high temperatures – some of them summer-like. These clear conditions also gave way to plenty of whale spotting and the ability to photograph the somewhat rare "green flash at sunset." Low sand levels have allowed some ghost forest stumps to pop up (in some unexpected places as well), they've revealed plenty of agate-rich spots on the central coast, and the north coast is still experiencing some stellar, record-setting clamming. Green Flash at Sunset. January 16, at Bayocean, near Tillamook, the clear skies give way to a staggering green flash at sunset. The first picture here shows the very last slivers of an orange disk just before it drops away. The sliver gets smaller and suddenly turns green – the most common incarnation of the green flash. BeachConnection.net also caught one in Manzanita the evening before, but these pics are much more spectacular. 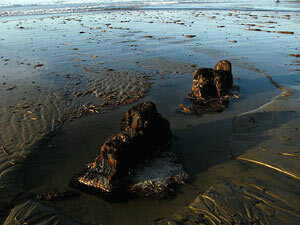 Ghost forest stumps at Rockaway Beach. Ghost Forests. They are showing up around Newport and Seal Rock, but the surprise was finding a small trio of them at Rockaway Beach. These examples of a 4,000-year-old forest are quite rare: the ones at Rockaway hardly ever show themselves. 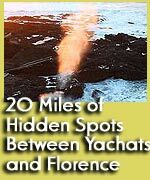 At the Curtis St. access just north of Seal Rock (near Newport), the bedrock being exposed may be as old as 20 million years. Also at this beach access is the slow emergence of the mysterious ghost forests. These are stumps about 4,000 years old, the result of being immersed in soil or sand, thus hidden from oxygen and never decaying as wood normally does in the open air. Neskowin has a stunning ghost forest that is visible year-round. More about ghost forests here. 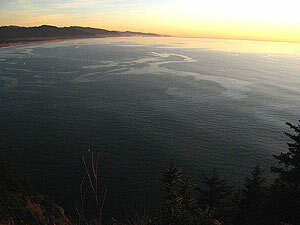 Manzanita on an almost balmy evening this week, where the winds are so calm there are no breakers offshore. Near-Record Temperatures. While the Portland area is freezing in the 30’s and 40’s, in spite of beautiful, sunny conditions, the coast is basking in the warmth of spring-like temperatures. 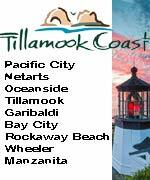 Much of the north coast had highs around 53 on Friday (January 16), but Pacific City and Lincoln City reported highs around 63. The real shocker was one thermometer east of Pacific City that reported in well into the 70’s. It’s a real weather freak show out there right now, and these conditions are expected to last at least ten days. 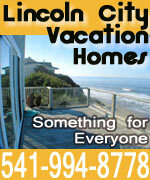 Sunny skies and temps in the 40’s and 50’s are predicted for the coast throughout that period. 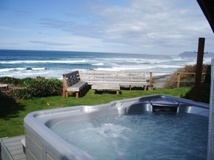 See the Oregon Coast Weather page for details. 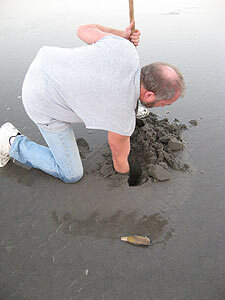 Keith Chandler of the Seaside Aquarium gets elbow deep in the sand to grab one of the plentiful clams. Record Razor Clams on North Coast. The recent assessment by Oregon Department of Fish and Wildlife (ODFW) for Clatsop Beach estimates them at more than nine million. Keith Chandler, manager of Seaside Aquarium, called it a record number. “It’s certainly the biggest set in a decade,” Chandler said. 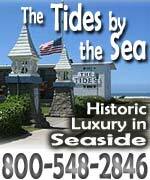 It’s only on the stretch of beach from Seaside to Warrenton – almost 20 miles of coastline. 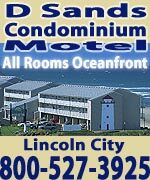 You need a license to go clamming, and there are number restrictions. 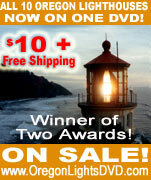 Regulation books are available free of charge where angling and hunting licenses are sold. For more information contact the Marine Resource Program (http://www.dfw.state.or.us/). 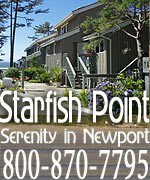 2040 SE Marine Science Dr, Newport, Oregon; or (541) 867-4741. 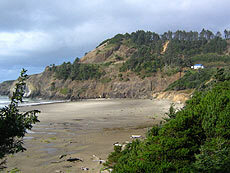 The extreme northern end of Agate Beach is a fantastic place to find agates where few go looking. DiTorrice said some beaches are full of them, and he’s seen the full range of colors. 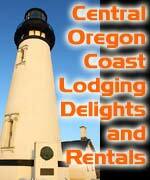 Almost a mile north of the big access to Agate Beach is the smaller city access, close to the bottom of Yaquina Head. There, a large patch of rockbed has been exposed by rains. While the main access to Agate Beach gets picked clean rather quickly, there’s hardly a soul wandering the northern part of the beach. They can also be found in fairly big numbers at the Curtis St. access just north of Seal Rock. To see more click here.